Welcome! > Hair > WTF is the denim hair trend? Maybe you’ve seen it on Pinterest: lovely locks that are a gorgeous mix of white or grey and differing shades of blue. While it may seem extreme to make your hair match your pants, it’s a gorgeous trend that leads to a frosty, cool look. If you’d like to try this statement trend, below is everything you need to know about the denim hair trend. Just as there are a ton of different shades of denim so are there tons of ways to color denim hair. 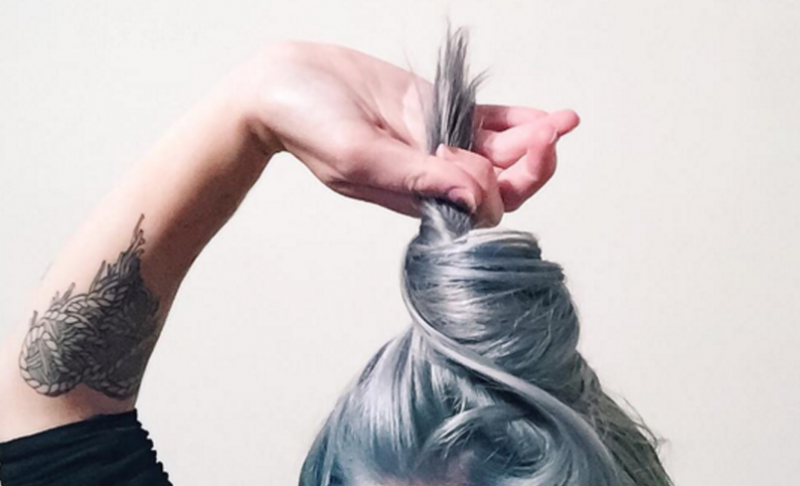 You can go more acid wash in tone, which means bright pastel blues and gorgeous shades of white hair. You can even mix in green and purple highlights, like some more colorful types of denim. You also can go a deep, muted blue, like dark pairs of denim jeans. Those are just a few of the options. Once you have your shade nailed down, you’ll want to figure out how to wear it. This is really a matter of creativity and preference. Some people have blue shades at the top of their hair that lead down into white shades, with some blue shades at the bottom of their hair. Others do a wispy highlighted look with tones of blue. Some have grey or white shades near the roots that lead into bright blue hues farther down, or blue farther up and white/grey farther down. Some people have different hues of subtle blue leading into brighter shades of blue for an ombre look. The key here is to let your hair be your canvas. This trend has a lot of nuances to it, so you may want to consider going to a stylist. It has bleaching, dying, highlighting and ombre styles all working together to create a distinctive look. If you don’t have a ton of experience working with wild hair colors and home hair dying, you may want to find that perfect photo of denim hair and take it into a stylist. They will probably be able to tell you how to maintain the look, since wild hair colors like blue can fade out pretty fast, especially the lighter shades. You may need regular gloss applications to keep the color vibrant. If you want to do your hair at home, it’s like any wild hair color. You’ll need to bleach your hair with a home hair bleaching kit for the blue to show, if you have dark hair. You’ll of course need hair very light if you’re going for a shade that incorporates platinum hues. If you have dark hair naturally, you could create a dark denim look by leaving your roots be and making the rest of your hair dark blue. Firmly tie up or put foil over the parts of your hair you don’t want to be that certain shade. Then go to town with wild shades of blue, green, purple, silver and grey dye from any of the wild hair color shades like Manic Panic, Directions, Special Effects, Splat or the L’Oreal pastel shades. Follow the directions carefully on the package and try to use temporary, semi-permanent or permanent shades together so that the colors are fading somewhat evenly. To maintain, wash your hair as infrequently as you can, wash your hair in water that’s as cool as you can stand it, use a color-protecting shampoo and conditioner and realize that you’ll probably need to re-dye frequently (as much as once every two weeks).